Research shows that the vast majority of transformation initiatives fail to deliver their expected benefits, the first risk associated with change is execution risk. To make matters worse, the vast majority of organizations we surveyed (77%) also report that managing resources across business functions have become more challenging over the past five years. Understanding what is at stake with a digital transformation is key to addressing potential risks. 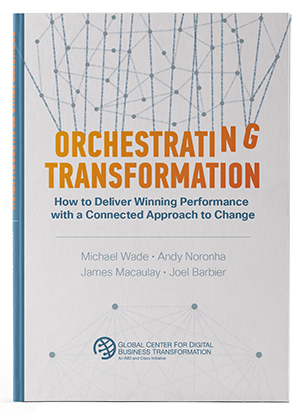 The perspective offered in our new book, Orchestrating Transformation is based on a practitioner’s experience. It will help organizations address the execution risk associated with transformation efforts. With a different, more holistic approach to change – one based on orchestration across organizational silos – companies can learn from best practices and improve their chance of success. Th book outlines competencies firms must possess to successfully mobilize their resources, and enable connections among them. What value can they create and deliver to their customers? How can they capture this value? How should they align their operations to become more agile? How can they measure success? Orchestrating Transformation proposes a set of tools – such as a capabilities assessment framework – that companies can use. Most important in a company’s transformation ambition should include an element of measurability to manage the associated risk. Discover how to successfully execute your organization’s digital transformation. Join our email list for exclusive content, news and updates.